Eat your way through Basque Country’s most populous city on a 2-night stay in Bilbao. 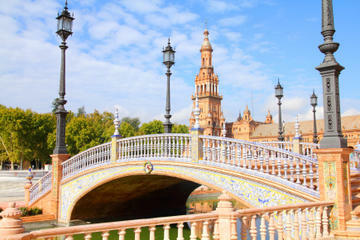 Explore the history of the thriving Spanish community during a self-guided culinary tour of Bilboa’s renowned ‘pintxos’ restaurant routes; visit the architectural marvel that is Frank Gehry’s Guggenheim Museum Bilbao; and spend your nights in a 3-star hotel just mere steps from the commercial center of an enchanting city that first charmed settlers in the 14th century. 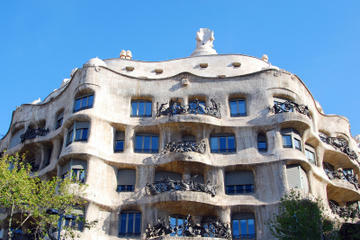 This thorough Bilbao experience offers an ideal combination of arts, dining and leisure time. 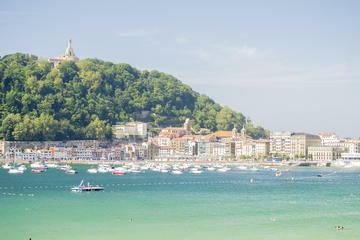 This comprehensive Bilbao experience offers an ideal combination of arts, dining and leisure time. The activities are available all three days to accommodate your schedule. The below itinerary is simply an example of how you could allocate your time and choose your activities. The afternoon of your arrival, check into your hotel, conveniently located near Bilbao’s commercial center and the city’s top sites. The music palace Euskalduna and city Auditorium are a 3-minute walk from your lodgings, and the city’s top museums—the Guggenheim, Fine Arts Museum, and Maritime Museum—are within easy walking distance. Let your tastebuds lead the way on a walking tour of places where you can sample multiple pintxos—miniature Basque bites, or appetizers. Reference your included road book, which suggests different routes, and explore at your own pace. Your can linger over the eight included pintxos and four drinks at one stop, or visit up to 12 different establishments during your very own food crawl. Make sure to reference the road book to learn the history of these ancient roads that have thrummed with port activity since the 14th century. If the previous night’s cuisine didn’t satiate your appetite, enjoy a leisurely breakfast at your hotel before exploring the cultural side of Bilbao. 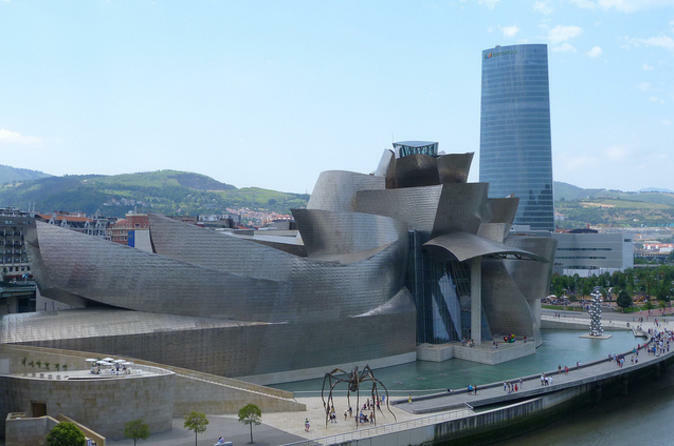 The Guggenheim Museum Bilbao, just a 15-minute walk from the hotel, is the best place to start. Designed by renowned architect Frank Gehry and hailed as one of the most important structures of its time, the museum has housed more than 100 exhibitions since it opened in 1997. Marvel at the way the abstract titanium exterior’s curves catch the light, then explore the Guggenheim Bilbao’s collection of modern and contemporary art. Highlights from the collection include major works from Willem deKooning and Andy Warhol, as well as Mark Rothko’s Untitled (1952-53). 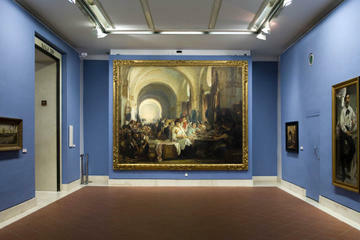 In a blend of the old and new, the museum also showcases work by modern and contemporary Basque and Spanish artists. It’s easy to spend a day enjoying the museum’s collection. Once you’ve had your fill of the arts, refer to your road book for any historical streets or buildings you might have missed during the previous night’s foray into the city. Tucked between two small mountain ranges, Bilbao has a rich background, and it’s easy to take a step back in time as you walk along the river or through tree-lined streets. If you didn’t get your fill of pan-fried scallops, cured ham and cañas (large beers) the night before, pop into any of the restaurants included in the dossier for another plate of pintxos before heading back to the hotel. Savor breakfast on your final day before checking out of your hotel. If there’s time, take one last walk through Bilbao’s streets to soak in the history—and maybe sneak in a final pintxo. There’s always more to be discovered around the corner of one of Basque country’s oldest and largest cities. If you cancel at least 31 day(s) in advance of the scheduled departure, there is a 5 percent cancellation fee. 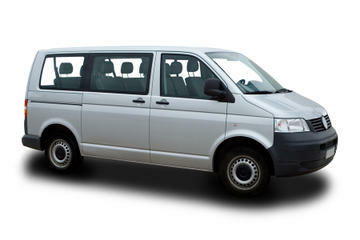 If you cancel between 14 and 30 day(s) in advance of the scheduled departure, there is a 20 percent cancellation fee. 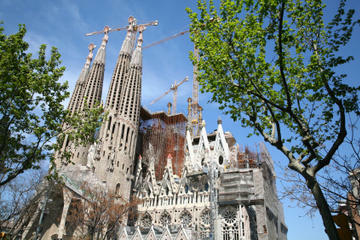 If you cancel between 8 and 13 day(s) in advance of the scheduled departure, there is a 40 percent cancellation fee. If you cancel between 3 and 7 day(s) in advance of the scheduled departure, there is a 60 percent cancellation fee. - Full Dossier with complete information, brochures, vouchers, city map and general information that will be delivered at the moment of check-in.